In her cookbook, Alice B. Toklas (Gertrude Stein's companion) wrote, "Cookbooks have always intrigued and seduced me." I'm obsessed with books. I have stacks in nearly every room of my house...on the coffee table in the living room, on the night stand in the bedroom, on the table & some chairs in the dining room, on the kitchen counter....everywhere. Lately, I've been particularly obsessed with cookbooks. Even though I have so many cookbooks that I've never cooked from, I still want to buy more. 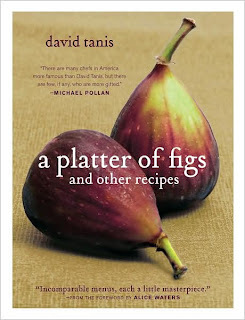 My most recent acquisition is A Platter of Figs by David Tanis. It's a beautiful book with seasonal menus. And when I spotted fava beans at Soulard farmers market last week, I knew exactly which recipe from the book I'd try first. I'm a little sad that favas aren't available more often so that I could eat this whenever I wanted...it was that good. To prepare the fava beans, remove the beans from their pods & boil them for 2-3 minutes. Shock the beans in ice water, then pop them out of their skins. See photos of the process here. Mix the beans with the sliced fennel, scallions, and a good sprinkling of salt. Drizzle generously with the olive oil to coat. Add the mint leaves & lemon juice. Toss and taste for seasoning. Top each serving with a few grinds of pepper and, if desired, a few shreds of parmesan cheese. I so want to get that cookbook. Your fava bean salad sounds delicious. I'm going to try the fava bean salad recipe tomorrow for my family of foodies. I think it will intrigue the taste buds!